“Stop Bullying Chosen Becky”- Desire Luzinda Warns Online Followers. Songbird Desire Luzinda has made a big call to all fans and users of social media platforms to act in good faith, and engage in fighting and eradicating cyber bullying, especially when it comes to fellow artiste Chosen Becky. The vice currently common among teenagers on social media platforms involves posting rumors, threats, sexual remarks, a victim’s personal information, and pejorative labels or hate speech for their own objectives at the expense of the victims. 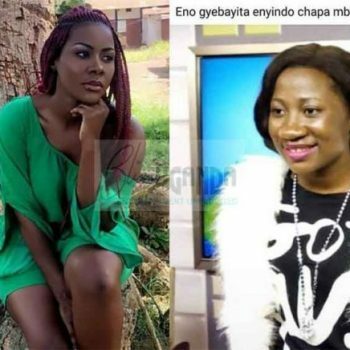 Borrowing a leaf from fast rising singer Chosen Becky who was recently insulted on social media by revelers to the extent of capitalizing on her God given nose to bring her. The mother of one has come out to echo for mutual respect and consciousness by online users in the way they utilize their accounts. Through her Facebook, the ‘Owekitone’ has initiated a campaign calling upon online users to embrace positivity among fellow users rather than demeaning them for the greatest good of every one’s living and reputation. “I stumbled on this picture that I found in my Facebook news feeds and I was disturbed ( not that it is the first time ). Cyber bullying is a growing problem because of increasing usage and embrace of online interactivity. I am talking about internet congregate mediums like Snapchat, Facebook, LinkedIn, twitter, instagram, tick tock, YouTube, Pintetest and others. The picture below is of Chosen Becky, a fast rising home artiste. She is an 18 year old who is trying to be somebody. Then you wonder at someone that chose to pick and capitalise on her God modeled ‘nose’ and put her down forgetting there will always be someone richer, someone prettier, someone who dresses better than the other and so is the world we live in, we cannot be the same. It starts with you in civil society organisations, academia, churches and political leadership to build on the ongoing conversation around cyber-bullying to make this world a better place,” affirmed Desire Luzinda.